Graduation at Belmont University in Nashville, Tenn. May 6, 2017. 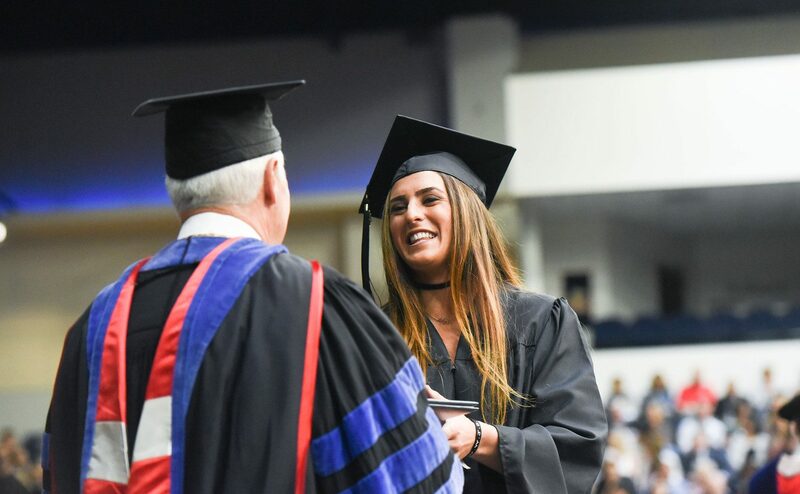 For Belmont, which draws that information from student and alumni surveys, the most recent rate is 94 percent, significantly higher than the national average and the strongest number to date the University has achieved. Recent graduate Elly Fell certainly fits that description. A double major in mathematics and music with a minor in business administration, Fell landed a position as an actuarial analyst for a Nashville firm. She helps prepare analyses for casualty lines of insurance coverage such as workers compensation, general liability and automobile liability. Belmont’s Career Development Team consists of experienced professionals who offer individualized assistance to current Belmont students and graduates. They partner with a number of local and national employers to connect individuals to job opportunities. From organizing large-scale career fairs to meeting one-on-one with current students and graduates seeking professional career coaching, the Career Development staff plays a critical role in Belmont’s efforts to promote the best possible outcomes for students’ education. The Office of Career & Professional Development is dedicated to focused engagement with students and graduates. Staff specialize in majors and industries based on career clusters, working directly with specific colleges across campus, an effort that allows them to tailor their services to students and graduates as well as connect with employer partners in related fields. And the office’s functions span a wide range of activities as they encourage career exploration, develop educational and professional partnerships and provide intentional career development programming. Want to know more about the programs and application process for Belmont University? Visit the Admissions website.